We believe that brands can and should live forever, and that creating a strong brand is the single greatest way to build long-term value. It’s not simple or short-term project. Being a good brand steward takes attention and effort. It involves several key services and components that we have identified and worked toward to become experts. For additional information, check out Our Ideas on Branding. Brand strategy is where it all begins, starting with a thorough brand strategy assessment. We dig into how your brand is currently perceived in the marketplace and work to steer your brand to positive attributes that resonate with your target audiences. The best way to stay ahead of the competition is to keep sharp eye on what they’re doing. We conduct deep research into your marketplace and your competitors. That way you can learn from their success and mistakes and – use that knowledge to leap ahead. Brand identity management is both art and science. We work with top brands to shape the face they show the world – and the one they use to draw talent to their organizations. Customer Engagement Optimization is when your brand, your voice, and your values are aligned. It bridges the gap between your brand’s personality and the continuously evolving technology required for a brand voice that is relevant and true to its value. 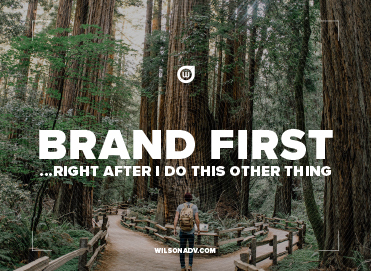 Brand First means that large or small, every action you take and your culture should be rooted in your brand purpose and how it relates to your audience. It’s an approach and philosophy that should encompass the entire organization, including the technology.